I was passing by a neighbourhood and noticed a small tree with a few clusters of small green fruit on its trunk and branches. It looked familiar and I immediately recognised it. "Hello, Bilimbi! I am so pleased to see you!" Yes, that's right. It was a Bilimbi tree and I never thought that I would find it growing in a public urban area. I excitedly plucked a few of the fruit (I love plucking fruits from trees, by the way) and I know where to get it for cooking in future. It is not only used as a souring agent but also gives body to a dish and can be pickled. If the tree grows more fruit, I will harvest and pickle them. 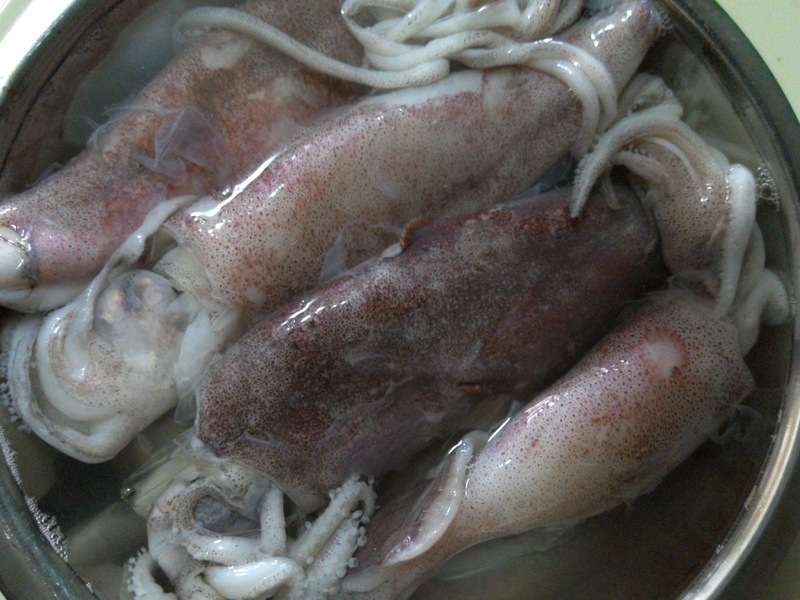 Initially, I had decided to cook prawns but when I saw these fresh and chubby squids, I could not resist buying them. 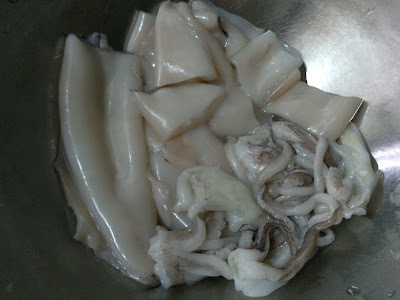 Remove skin, cuttlebone, eyes, beaks, entrails and ink sac from squids. Wash thoroughly and squeeze excess water. Slice each squid into four rings. Slice fresh chillies, shallots, garlic and turmeric into small pieces and blend together with dried chillies and some water in a food processor or blender until fine. Remove dried outer layers of lemongrass and trim away the top and ends of the stalks leaving behind 12cm of the bulbous part. Crush with the flat side of a cleaver or rolling pin. 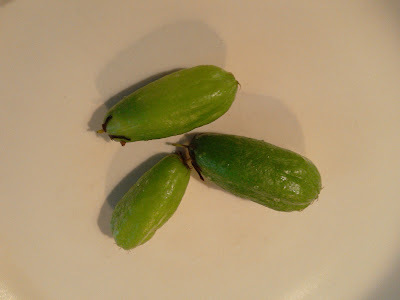 Slice bilimbi into 1cm width. ** If bilimbi is unavailable, substitute with lime juice. Shrimp paste can be omitted or substituted with fish sauce but flavour will be slightly different. Heat oil and saute blended ingredients for a few minutes. Then add lemongrass, shrimp paste and continue to fry over medium low heat until a little oil breaks through and is fragrant. Mix in squids, bilimbi and stir for two minutes over medium high heat. Add hot water, cover and simmer until cooked. Uncover and season with salt. 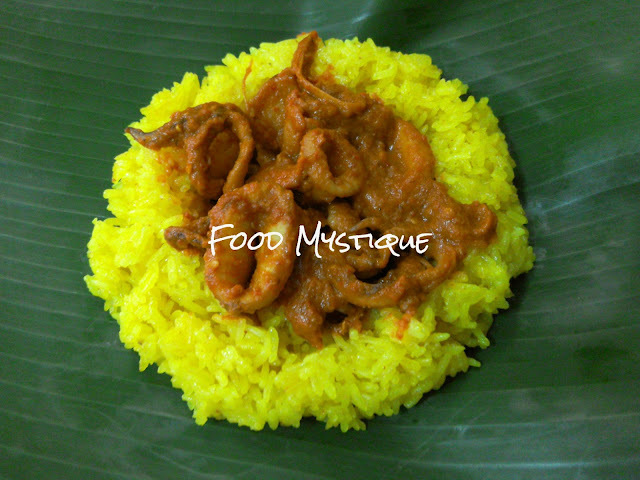 Serve with any type of rice. 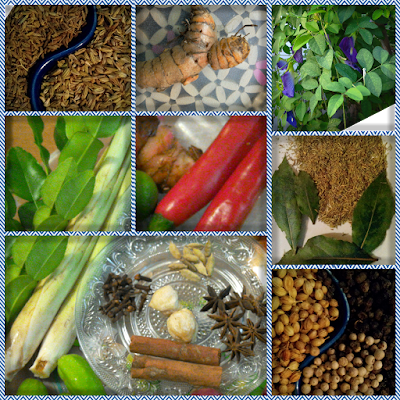 Goes very well with turmeric glutinous rice. 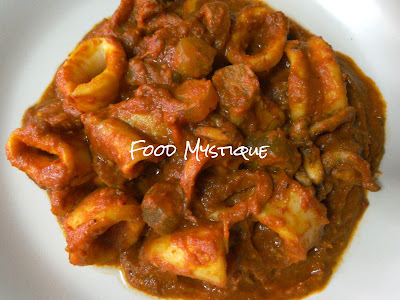 Usually, it is accompanied by a traditional rich curry but believe me, this lightly sweet, sour and spicy squid recipe tastes great with the the rich and filling glutinous rice. My recipe will be on another page.